Improve rankings on Google and own your backyard with Proven SEO strategies for Jewelers. SEO audit of your website. The process of search engine optimization for jewelers lets you achieve high placement on search engine results pages for keyword phrases that are relevant to your products and services. This allows qualified traffic to find you—millions of daily search users can see your company URL at the top of their search results, and the traffic is highly targeted, as your site is optimized for phrases that will bring ROI. SEO or Search Engine Optimization is the practice of making a website favorable enough for the search engines to find them and rank them for relevant search terms. You do not pay per click on your organic links on the Search Engine Results page and instead, take advantage of the highly relevant traffic that engages with your website better. Benchmark where you are at today. Implement the Strategy specifically designed for your store. Get monthly reports with real results. Analyze what works and better it. 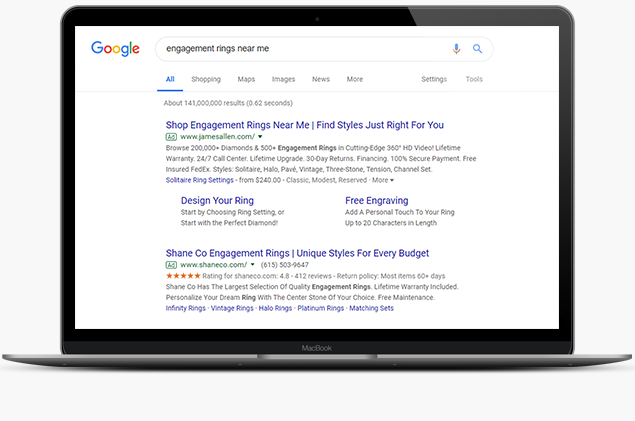 Compile a list of highly-searched keywords for the jewelry industry, based on search volume to target by utilizing our comprehensive keyword tools and SEO industry knowledge. A complete audit of the website, including link structure, content, code, tracking implementation, backlink profile, on-page SEO elements. Benchmark where you are at and where you need to be. Creating and adding relevant content on a regular basis and optimizing existing content to be more search engine friendly. Creating a linking of content within the website and also build successful backlinks to the website to improve its overall quality score. Since Google’s local algorithm is separate, we focus on local optimization that includes Google My Business optimization, NAP syndication, local schema implementation. Monthly SEO reporting with all tasks completed and organic performance metrics by a dedicated Account Manager with a quick turnaround-time of less than 24 hours. Search Engine Optimization is the practice of ranking a website on a search engine. Did you know that the websites listed on the first page of Google takes 91.5% of all search traffic (according to a study by Chitika)? When someone is searching on a search engine, they are doing so with an intent to take action and it is safe to assume that they are in the market for that product or service they are searching for. Being outranked by your competitors could mean lesser traffic resulting in lesser leads and sales. How long does it take to start seeing better search engine rankings? SEO is highly dependent on the search engine's ever-changing algorithm. DId you know that Google changes its search algorithm 500-600 times a year? That is a lot to keep up with! Every time a significant change is made the SEO specialist has to learn and adapt to it and implement the changes following the best practices. Since the optimization is mean for "organic" search, Google likes to give brownie points to you doing good optimizations "organically." This is why unlike paid ads that can go up in minutes with a little budget thrown behind them, organic rankings take up to 6 months to start improving. It depends on a lot of factors but an average of 4-6 months is when you can start seeing results. Can Smart Age work with any website platform? We can work with most website platforms like wordpress, magento, shopify, squarespace, 3dcart, bigcommerce, etc. As long as your website platform is not controlled by a central system with a parent-child relationship, we are able to optimize your website easily. We work with your web team to get the access to your CMS (content management system) and make optimizations regularly. I have done SEO before why do I need it again? SEO is not a one-time change. It is an activity that should be done on a regular basis, just like you maintain and clean your store. Google's algorithm changes more than 500 times a year and it is impossible to keep up with it unless you are doing regular optimizations on your website using an SEO partner who knows the technicalities behind these updates. I have been doing SEO, why is my competitor ranking better than me? There could be a number of reasons why your competitor is ranking better. They could have had an older website with more history on Google. Other than that there are things like regular updates to the website content, more content/pages on the website, better link structure, faster site speed, quality backlinks, and optimized images. A good SEO provider that knows your industry should be able to tell the exact reasons and help you work towards a strategy to outrank your competitor. But remember it is not a quick change, it takes time. How can I measure if Search Engine Optimization efforts are working? A good place to start is your Google Analytics account. You can ask your Smart Age dedicated Account Strategist to go through the Organic channel performances with you. If you see your overall traffic from Organic channel is improving year over year, that is the first indicator. You can also see the rankings report for the keywords your website is being ranked for. For the local terms, one good place to look at is the Map Pack. For example, when you search for jewelry stores in new york city, you will see a map view with 3-4 listings under it. The ones that are not the paid ad are also driven by your SEO efforts.